Having reviewed the wide range of signage solutions only the most comprehensive solution available, but also the most cost effective”. available, it was quickly decided that Optoma had not only the most comprehensive solution available, but also the most cost effective. Richard Gill, Managing Director, Danem UK Ltd. The installation was very straightforward, carried out professionally within a single day and completed well ahead of schedule – a measurable and marked success. The window signage display is very effective at pulling more public into our store while the cashier display has defiantly helped to increase our in store sales. Tim Dudding, Marketing Manager, BHAFC. Having received a lot of positive feedback from our customers and fans alike regarding the new signage system, we are very happy with the end result and confident that Optoma’s D5000 was the best solution for us. Challenge: To provide the Brighton and Hove Albion football club (BHAFC) store with a permanent window display to help capture the attention of the passing public and a POP display to further promote the clubs merchandise, games schedule and season tickets once people enter the shop. 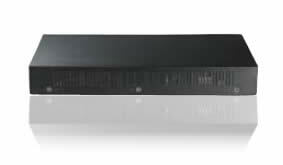 Solution: 2x Optoma D5000 advanced media players and 2x third party LCD screens were installed. A full software suite upgrade was included as standard with no ongoing license subscription fees, no user license fees and no site license fees. August 2009, the BHAFC were looking for a signage solution to be installed at their new and fully re-fitted shop located in Queen’s Road, Brighton. The BHAFC sought to modernise communications in two ways; a window signage display to help capture the attention of the passing public, bringing them in store and via a POP display to further promote the clubs merchandise, games schedule and season tickets once people enter the shop. The brief was for a user friendly, easy to use and update signage system to meet their immediate needs. Also, to allow simple, unrestricted expansion to the system when required in the future. Danem UK Ltd was commissioned by the BHAFC to provide this solution. 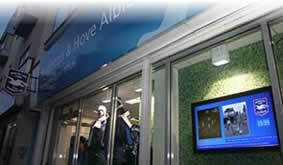 Prior to the Optoma D5000 install, there was no digital display installed in the BHAFC shop front. The BHAFC were looking for a digital signage solution that was eye catching and that could provide visitor’s with relevant information about the club as well as merchandise promotions. Another requirement was to include separate information and images across the individual screens. Richard Gill, Managing Director, Danem UK Ltd explained why they approached Optoma for this project: “Having reviewed the wide range of signage solutions available, it was quickly decided that Optoma had not only the most comprehensive solution available, but also the most cost effective”. Floor space within any environment is at a premium but especially when it comes to retail floor space. The BHAFC had limited floor space in which to place a display screen, so it was decided that the ideal location for each player would need to be above the nominated display device, hidden within the false ceiling. The BHAFC wanted to utilise the screens to their full potential without too much disruption to the retail floor space: “The Optoma SignShow D5000 was highlighted as one of the only lightweight, engineer friendly and very compact solution products available that, due to design, would not be affected by the harsh operating environment that had been allocated to them.” Richard Gill, Managing Director, Danem UK Ltd. The installation company, Danem UK Ltd compared the Optoma offering to other similar solutions. They found the cost of ownership over a 3 to 5 year period made the Optoma D5000 an obvious choice. With all upgrades included as standard, the full suite of software and no ongoing licence subscription fees the choice quickly became an easy one. The Optoma D5000 was also the only solution that could easily be integrated into the BHAFC’s existing installation. In addition, the D5000’s content creation software is user licence free, intuitive and all training was included free of charge. “The installation was very straightforward, carried out professionally within a single day and completed well ahead of schedule – a measurable and marked success.” Richard Gill, Managing Director, Danem UK Ltd. To ensure the client (BHAFC) was happy and the installation was a success, the Optoma digital signage specialist was made available on site to provide end user training. BHAFC were not only looking for a system that was easy to use, but also one with no monthly subscription charge or maintenance costs. Additional requirements included a system that they could change instantly with the ability to have pictures or video with text. The installation company, Danem UK Ltd, had looked at a few systems but selected the D5000 because it offered a small, light compact solution and produced no extra noise or heat. Another deciding factor was the D5000 system included pre-made templates which made inputting data very easy and quick. Following the installation, BHAFC’s football club shop has been transformed with the addition of the new digital window signage and POP display at the back of the store. The D5000 has enabled BHAFC to update their customers more effectively: “The window signage display is very effective at pulling more public into our store while the cashier display has defiantly helped to increase our in store sales.” Tim Dudding, Marketing Manager, BHAFC. 2x Optoma D5000 advanced media players, 2x 55” HD third party screens, 1x third party ceiling mount and 1x third party wall mount.